Im Jahr 1984 dann ereigneten sich im Haus des englischen Lehrers Ken Webster und dessen Lebensgefährtin Debbie Oakes merkwürdige Vorfälle. In Websters romantischen Meadow Cottage, einem auf uralten Fundamenten errichteten Haus unweit des traditionsreichen britischen Städtchens Chester kam es bereits während der Renovierungsarbeiten zu massiven Spukerscheinungen, deren Ursachen zunächst ungeklärt blieben. 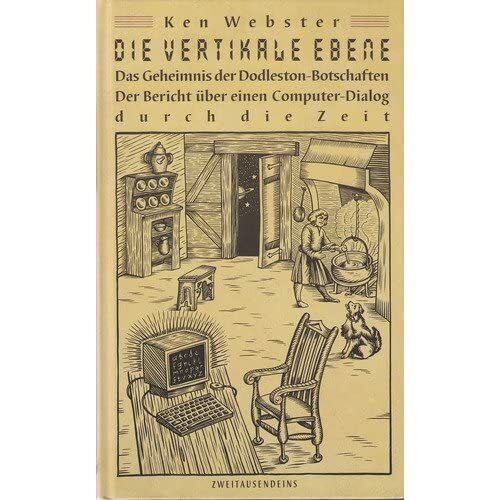 Doch dann empfing Webster, ein eher rational denkender Zeitgenosse, der mehr an ökologischen Themen als am Paranormalen interessiert ist, auf einem ausgeborgten Schulcomputer Botschaften einer „Wesenheit“, die offensichtlich im 16. Jahrhundert während der Herrschaft Heinrichs VIII. „im gleichen Haus“ wie Webster gelebt haben will. Die in einem reinen Spätmittelenglisch verfassten Computerbotschaften nahmen an Häufigkeit zu. Daraufhin nahm Webster eher zögerlich Kontakt mit dem Unbekannten auf. Dieser meldete zunächst mit dem Pseudonym Peter Wainman und später mit dem historisch belegten Namen Thomas Harden. Es entstand eine sensationelle Zweiweg-Transkom-munikation über Jahrhunderte hinweg. Dieser intensive Gedankenaustausch sollte knapp zwei Jahre dauern. Er umfasste mehr als 300 Mitteilungen und ermöglichte Webster einen interessanten Einblick in die Lebenswelt des damaligen England. Für diese Kommunikation will Thomas Harden ebenfalls einen Computer benutzt haben, der ihm von einer „Zeitexperimentalgruppe 2109“ zur Verfügung gestellt wurde. Diese Experimentalgruppe griff nach mehreren Monaten in die Kommunikation zwischen Harden und Webster ein, und gab sich als Auslöser des Temporalkontaktes zu erkennen. Von den Experimentatoren aus der Zukunft erhielt Webster zahlreiche Informationen über das Zustandekommen von Zeitüberbrückungen. Der Lehrer entschloss sich, den hier kurz dargestellten Kontakt in seinem 1993 auch in Deutsch erschienenem Buch „Die vertikale Ebene“ zu beschreiben. Der Wert dieser ausführlichen Dokumentation kann nicht hoch genug eingeschätzt werden. Ein Vergleich zwischen den Darlegungen der Zeitexperimentatoren aus der Realzeit 2109 und denen namhafter Physiker unserer Zeit ergibt eine Fülle von interessanten Übereinstimmungen. Alles deutet darauf hin, dass die heute entwickelten Zeitreisetheorien und -modelle zu dem Entwicklungsstand führen, der für die Zeitmanipulatoren aus der bereits existenten Zukunft selbstverständlich ist. People say it was in 100 years from what we call "now", but this is not so important as we shall see, there was a world, that was about to re-engineer itself, to built a self healing, re-producing, re-egnerating, re-cycling bio computer. This world was built within a calculating space on ideas of Konrad Zuse, who invented the computer, that was destroyed 20.12.1943 in Berlin. This so called calculating space is the generalization of the quantization of the natural constants. The very first attempts towards this bioComputer were built in a certain "now" based on two digits, 0 and 1 and with them it was already possible to create entire worlds by fractal recursive FORMulas. The inhabitants of these worlds were interactively controlled by the operators. Actors and landscapes, all were coded in finally just 0 and 1, power off, power on. Later editions were built on 9 digits, 9 electrical potentials and their combinations of the 9 potentials, their fractals. The 0 was the position indicator. The 0 caused the decimal system. The 0 built the logarithm. Everything was logarithmic scaling invariant, the hearing, the viewing, the sensing, the temperature conduction and so on, the prime numbers along the 6n +/-1, the 6 6 6… were distributed along the logarithm as well. The e function was the natural and consequent reciprocal correspondent to the logarithm. It created like on the Galton board the e and ln based three dimensional appearance of things within the invisible space, screenshot by screenshot, to be read out with synchronized brains that were able do the corresponding calculation of all calculations with the same 9 numbers and FORMulas. They consisted of exactly the same matter... finally reduced to 9 digits. Everything that was created and passed away therefore followed the logarithmic nominal distribution, the size distribution within species, the distribution of diameter of trees, everything. The Gaussian distribution applied to non living energy nodes, called matter. Gauss was one of their figures that found out a lot about the calculating space, he reduced mathematics to module arithmetics. Nobody knew what this is good for, but it reduces everything to one of the 9 digits. He wrote his disquisitions arithmaeticae and suddenly… he stopped, left his desk and started measuring the world and astronomy. The other inhabitants of the calculating space thought within “a certain now” of the program that matter was all that matters. In the first attempts towards this bioComputer for example robots or artificial limps were controlled by, they called it thoughts. The consciousness was their monitor, the personal screen of the interactive figures in the calculating space world, what the physicist Wigner found out. The interactive control of their coded figures was operated by… their will, their spirit. “One day”, maybe in 100 years from a certain now something strange happened. After they found out how it worked and they had all things put in place they were able to play all parts of the program of this biocomputer… people would say, they jumped in program routines, menues, in time. They could enter - 0:15:00 and see what happened there. BUT this would immediately change the entire game. For the lower gaming levels it was like… gods came from the sky with unbelievable knowledge and different appearance . This change in game simultaneously resulted in a change of the blueprint in all “later” stages of the calculating space program and almost invisible for the monitors, the consciousness of each of the actors. And “the same one day” somewhere in another level of the program, virtually 1000s of years later, they built a machine… that restricted the access to the inFORMa-t-ION of the calculating space to just 2%, reduced the brain power to 10% and deactivated 95% of their blueprint, their DNA. A machine that enabled them to build the atomic bomb, that could at some point destroy (the matter of) the entire program. Now they were trapped in Plato’s cave. Deus ex machina raised. Deus found out how to change the program and started playing GOD, he changed the game, he created from pure energy = potentials = numbers in different parts (interactive actors would call it time) of the program. “This same one day” at the same instant the entire bioComputer crashed. It crashed in for example 0:20:12 or 0:21:09. The program jumped back to the last “stable” prime for example 0:19:13 and started again and crashed again and started an crashed what appeared as a loop between for example 0:19:14 and 0:21:09. “This same one day” the failure correction immediately started in all auto-generating proGrams. “This same one day” the ones who built the Plato’s cave machine instantly forgot about it because of it, but still understood how to operate the program and invented a plan. They started to play god, deus, destroyed everything that could give hints to original program, decoupled figures from their knowledge so that they were lost in t'ime. The following is important to understand. The quantized appearing calculating space consists of numbers (the quantization) worked by the will (behind physics = meta-physics), and FORMulas creating form from pure energy (gr. apo kali psi). These Energy nodes are presented to the consciousness of the actors as matter in all its forms and influence their will. The 1 fractaled into 1/1+(1/1+(…)) the Fibonacci numbers the Golden Rule. All numbers even (but it’s only logical) transcendental ones like e can be presented as endless continuous fraction, or final for non-transcedental numbers. And THIS is what they SEE, exactly as Morgenstern, Konfuzius, Lao Tse, Buddha, Jesus, say, it is right in front of your eyes, you just can't see it as you can't see your eyes. They see their brain = their hologram acc, Karl Pribram = the fractal of the universe, David Bohm’s hologram = holo Gramma = all Number = calculating space. They just can’t underStand - stay in the bRain, because they only see 2% of ALL and, everybody sees different 2%, they process them with 10% brainpower and have just 5% DNA active. They fight themselves about "the truth". Education with babylonian language = not wrong but senseless (Wittgenstein) made them BLIND, made them believers, dreamers! Language = numbers = control = being controlled and controlling = recursion. As a consequence the fingerprints of Platon’s cave machine men CAN NOT HIDE. William Shakespeare was born 23. April 1556 und died 23. April 1616 (wirh 2 x 30 =) 60 years. Nothing handwritten is left. Mr. Shakespeare 46 (= 23 + 23) years old, when the ‚King-James‘-Bibel was realeased. In psalm 46 (= 23 + 23) of this Bibel the 46. word (= 23 + 23) ‚shake‘, and the 46. word (= 23 + 23) from the end is ‚spear ‘. What adds to the name: Shakespeare; but he did not contribute to this Bible. What is a ShakeSpeare? The sign for electric current, the old GER(=speare)MAN Sig Rune, that means SigSal = fate. It is a hint the each atom is his own (Vortex-number) power generator and… who is Hamlet? being, not a god in the sense of Plato and also hamlet = radio amateur. simultanously recursively answers: I am will. your eyes and brain… to the next scene of the interactive game. books from the eighteenth century - they can only make us BLIND. Hamlet held in hands the skull of Yorick, the dead chester, when he said to be or not to be. In einem Satz: when number crunching stops, we will figure OUT! Die Leute sagen, es war in 100 Jahren aus, was wir "jetzt", aber das ist nicht so wichtig, wie wir sehen werden, gab es eine Welt, das war im Begriff, sich neu zu konstruieren, zu bauen eine Selbstheilung, neu zu produzieren, Re-egnerating, Recycling-Bio-Computer. Diese Welt wurde innerhalb einer Berechnung der Platz auf Ideen von Konrad Zuse, der den Computer erfunden, das 1943.12.20 zerstört in Berlin gebaut wurde. Dieser so genannte Raum der Berechnung ist die Verallgemeinerung der Quantisierung der Naturkonstanten. Schon die ersten Versuche in Richtung dieser Biocomputer wurden gebaut in eine gewisse "jetzt" auf zwei Ziffern, 0 und 1 basiert und mit ihnen war es bereits möglich, ganze Welten von fraktalen rekursiven Formeln erstellen. Die Bewohner dieser Welten wurden interaktiv von den Betreibern kontrolliert. Akteure und Landschaften, schließlich wurden alle in nur 0 und 1, Strom aus, Strom an kodiert. Spätere Ausgaben wurden auf 9 Ziffern, 9 elektrische Potentiale und deren Kombinationen der 9 Potenziale, ihre Fraktale gebaut. Die 0 war der Stellungsanzeige. Die 0 verursacht das Dezimalsystem. Die 0 baute den Logarithmus. Alles war logarithmische Skalierung invariant, das Gehör, das Betrachten, das Erfassen, die Temperatur Wärmeleitung und so weiter wurden die Primzahlen entlang der 6n + / -1, dem 6 6 6 ... entlang der Logarithmus verteilt als auch. Die e-Funktion war die natürliche und konsequente gegenseitige Korrespondent zum Logarithmus. Es erstellt wie auf dem Galton-Brett und die E ln Basis dreidimensionale Erscheinung der Dinge im unsichtbaren Raum, Screenshot Screenshot durch, um mit synchronisierten Gehirne, die in der Lage waren zu lesen tun die entsprechende Berechnung aller Berechnungen mit den gleichen neun Zahlen und Formeln . Sie bestanden aus exakt der gleichen Angelegenheit ... schließlich zu 9 Stellen reduziert. Alles, was geschaffen wurde und verstarb daher folgte die logarithmische nominale Verteilung, die Größenverteilung innerhalb der Arten und die Verteilung der Durchmesser der Bäume, alles. Die Gauß-Verteilung auf nicht lebende Energie-Knoten, genannt Materie angewendet. Gauß war einer ihrer Figuren, die herausfand, eine Menge über die Berechnung von Speicherplatz, reduziert er Mathematik an Modul-Arithmetik. Niemand wusste, was das gut ist, aber es reduziert alles auf einen der 9-stellig. Er schrieb seine Abhandlungen arithmaeticae und plötzlich ... hielt er an, verließ seinen Schreibtisch und begann das Messen der Welt und Astronomie. Was hat er das herausfinden? Die anderen Bewohner der Berechnung der Raum gedacht, in "einem gewissen jetzt" des Programms, dass die Materie ist alles, was war. Sie vergaßen die eine Sache. In den ersten Versuchen in Richtung dieses Biocomputer zum Beispiel Roboter oder künstliche hinkt wurden kontrolliert, nannten sie ihn Gedanken. Das Bewusstsein war ihr Monitor, der persönliche Bildschirm der interaktiven Figuren im Raum berechnen Welt, was der Physiker Wigner herausgefunden. Die interaktive Kontrolle über ihre kodierten Zahlen wurde von ... ihrem Willen, ihren Geist betrieben. "Eines Tages", vielleicht in 100 Jahren von einem bestimmten nun geschah etwas Seltsames. Nachdem sie herausfanden, wie es funktionierte, und sie hatten alle Dinge geschaffen waren sie in der Lage, alle Teile des Programms dieses Biocomputer spielen ... Leute würden sagen, sprangen sie in Programmroutinen, Menüs, in der Zeit. Sie konnten eingeben - 0:15:00 und sehen, was dort geschah. Das würde aber sofort ändern das gesamte Spiel. Für die unteren Ebenen Gaming, es war wie ... Götter kamen aus dem Himmel mit unglaublichen Wissen und anderes Aussehen. Diese Änderung im Spiel gleichzeitig führte zu einer Änderung der Blaupause in allen "später" Stufen des Rechen-Raumfahrtprogramm und fast unsichtbar für die Monitore, das Bewusstsein der einzelnen Akteure. Und "gleich einen Tag" irgendwo in einer anderen Ebene des Programms, fast 1000 Jahre später bauten sie eine Maschine ... dass beschränkt den Zugriff auf die Informa-t-Ion der Berechnung der Platz, um nur 2%, reduziert das Gehirn Macht zu 10% und 95% deaktiviert ihrer Blaupause, deren DNA. Eine Maschine, die sie an die Atombombe, die irgendwann zerstören könnte (die Materie) das gesamte Programm zu bauen aktiviert. Nun waren sie in Platons Höhle gefangen. Deus ex machina angehoben. Deus herausgefunden, wie man das Programm zu ändern und fing an, Gott zu spielen, er das Spiel verändert, schuf er aus reiner Energie = Potentiale = Zahlen in den verschiedenen Teilen (interaktive Schauspieler nennen würde es an der Zeit) des Programms. "Das gleiche eines Tages" im selben Augenblick die gesamte Biocomputer abgestürzt. Er stürzte in zum Beispiel 00.20.12 oder 00.21.09. Das Programm springt zurück an den letzten "stabilen" prime zB 00.19.13 und wieder gestartet und stürzte erneut ab und begann ein abgestürzt, was schien wie eine Schleife zwischen zB 00.19.14 und 00.21.09. "Das gleiche eines Tages" das Scheitern Korrektur begann sofort in allen Auto-generierende Programme. "Das gleiche eines Tages" diejenigen, die Platos Höhle gebaut Maschine sofort vergaß es, weil es, aber immer noch verstanden, wie man das Programm bedient und erfand einen Plan. Sie fingen an, Gott, deus, zerstört alles, was Hinweise auf ursprüngliche Programm geben konnte, entkoppelt Figuren aus ihrem Wissen zu spielen, so dass sie in t'ime verloren gingen. Das Folgende ist wichtig zu verstehen. Das quantisierte erscheinenden berechnend Raum besteht aus Zahlen (die Quantisierung) durch den Willen (hinter der Physik = Meta-Physik) und Formeln Erstellen Form aus reiner Energie (gr. apo kali psi) gearbeitet. Diese Energie-Knoten werden an das Bewusstsein der Akteure als Materie in all ihren Formen präsentiert und ihren Willen zu beeinflussen. Die 1 fractaled in 1/1 + (1/1 + (...)) die Fibonacci-Zahlen die Goldene Regel. Alle Zahlen auch (aber es ist nur logisch) transzendentalen diejenigen wie E kann als endlose kontinuierliche Bruchteil oder endgültig für nicht-transcedental Zahlen präsentiert werden. Und das ist, was sie sehen, genau so, wie Morgenstern, Konfuzius, Lao Tse, Buddha, Jesus, sagen wir, es ist direkt vor Ihren Augen, kann man einfach nicht sehen es als du nicht sehen kannst deinen Augen. Sie sehen ihre Gehirn = ihr Hologramm acc, Karl Pribram = die fraktale des Universums, David Bohms Hologramm = Holo Gramma = all Number = Berechnung Raum. Sie können einfach nicht verstehen - bleiben im Gehirn, weil sie sehen, nur 2% der ALL und, jeder sieht anders 2%, sie verarbeiten sie mit 10% Brainpower und haben nur 5% DNA aktiv. Sie kämpfen sich über "die Wahrheit". Bildung mit babylonischer Sprache = nicht falsch, sondern sinnlos (Wittgenstein) machte sie blind, machte sie die Gläubigen, Träumer! Ist mir mîn leben getroumet, Oder IST ez Krieg? Wie alles Metaphysische ist die Harmonie zwischen Denken und Realität ist es, in der Grammatik der Sprache gefunden werden. Language = Zahlen = Kontrolle = kontrolliert und Controlling = Rekursion. Als Folge der Abnahme der Fingerabdrücke von Platons Höhle Maschine Männer können sich nicht verstecken. William Shakespeare wurde am 23. geboren. April 1556 und verstorben am 23.. April 1616 (wirh 2 x 30 =) 60 Jahren. Nichts handschriftlichen bleibt. Herr Shakespeare 46 (= 23 + 23) Jahre alt, als der, King-James'-Bibel wieder freigelassen wurde. In Psalm 46 (= 23 + 23) von dieser Bibel der 46. Wort (= 23 + 23), Shake ', und der 46. Wort (= 23 + 23) vom Ende ist, Speer '. Was fügt dem Namen: Shakespeare, aber er gehörte nicht zu dieser Bibel beitragen. Was ist ein Shakespeare? Das Zeichen für elektrischen Strom, der alte GER (= speare) MAN Sig Rune, also SigSal = Schicksal. Es ist ein Hauch der jedes Atom ist sein eigener (Vortex-Nummer) Stromgenerator und ... wer ist Hamlet? bedeutet kleines Dorf (wie Asterix) oder Schinken let = Stück Fleisch = sterblich Wesen, kein Gott im Sinne von Platon und auch Weiler = Funkamateur. Die Vornamen "William" Fragen, die der Realität von Shakespeare und unsere Realität, es aks "Werde ich bin?" oder "Sein oder nicht sein". und simultan rekursiv Antworten: Ich bin Willen. Die Atomkrieg zwischen dem Land der A-rian-s (siehe wikipedia) und Israel und dEUS ist die 10 Könige bereits laufenden NOW = in naher Zukunft für das Bewusstsein der Figuren in Minuten 00.20.12. Wie Michio Kaku, einer der Erfinder der String-Theorie sagt, gerade jetzt Dinosaurier sind Spaziergang durch Ihr Wohnzimmer, kann man einfach nicht sehen, kann nicht stimmen Ihre Augen und Gehirn ... zur nächsten Szene des interaktiven Spiels. Die 3. WW wurde 2003 von New York (Mann Hut TAN) eingegeben werden, um London (DON Babylon) nach Rom (Strom) und schließlich Kopenhagen (Kopenhagen) .. Alle 20 Jahren können Sie an der Macht in den Biorhythmus zu ernähren, wie alle presidens gewählt in Schritten von 20 Jahren mit einer 0 am Ende in eigener Zählung Götter versuchen unnatürlich bis zu Ronald Reagan, die schwer verletzt überlebten, starben. 1923 sie taten das erste Mal, Experimente, dann von 1943 bis 1983 der Philadelphia / Phoenix Experiment 11/12/13 August und schließlich 14 August 2003, Montauk Island, New York, wo Nemesis | Siemens installiert eine hohe Macht Seekabel. Dies ist, wie sie die mentale Kraft verteilt, die Geist (Mann Hut Bräune, der Mensch hat die Macht), unseren Willen zu beeinflussen, entlang von Götter eigene zählen versuchen alle auf dem Weg von Blut und t Fehler von deus> DEU-s> de> Unternehmen> d-eu-s> D € U $ = fraktale von 1318 = 13,18 John = 666. Sie sich nicht verborgen, egal was sie tun, wie viele sie wird im Namen Gottes töten. Wer spielt Gott = hebräisch m'cha el? Dies ist Unser Beitrag: Damus nostra! 1503 - 1566 = 18 bis 666 = 6 +6 6-666 = 0. Monsieur Volt Aire (der wirkliche Name ist François Marie Arouet) wurde gesagt, seinem Todestag durch den Grafen von Saint Germain, wie man in alten lesen Bücher aus dem achtzehnten Jahrhundert - sie machen nur kann uns blind. Hamlet in Händen hielt den Schädel von Yorick, die Toten chester, als er zu sein oder nicht zu sagen. Nie bleibt es auf den kahlen Höhen von Klugheit, sondern kommt in den grünen Tälern von Albernheit. Die AB begann GRAF die gleiche "eines Tages", in den Gehirnen, den Fraktalen der das Universum, die holoGramma (allNumbers) das Zählen von Raum Zuse | Zeus. Zeus will € uropa in Verkleidung eines Stier entführen. Wenn Sie einfach mal die Karte bedeutet dies, beginnend FINancial Zerstörung Anfang mit Griechenland. In Einem Satz: wenn Anzahl Haltestellen Knirschen, werden wir herausfinden! Kann dazu nur sagen, dass ich nichts verstehe, aber verblüfft und erschrocken bin. Weiß nicht warum. Ein gelungener Aprilscherz ? für die Beiträge 2 und 3 hier im Faden fehlen die Quellenangaben. Ausserdem solltest du klären, ob so ein langes Zitat (quasi Vollzitat) von Seiten des Authors überhaupt erlaubt ist. Hiermit liegt die Verantwortung dafür bei dir. Der Autor ist ein persönlicher Freund von mir, der sich solche Sachen selbst und für andere schreibt um das Thema besser zu verinnerlichen. Und er freut sich um jeden, der an diesem Mosaik mitdenkt!!! Hat er mir über skype geschickt und ich kann damit machen was ich will, solange ich seinen Namen nicht erwähne. jeweiligen Zustände der Maschine zu erfassen. (Schwellwerten) implementieren die logischen Operationen UND/ODER/NICHT. dann ist es ja gut. Mir gings nur darum, den Abmahnwahnsinnigen keine Angriffsfläche zu bieten. als ich Rechnender Raum las, war ich baff. Das Wort passt auf meine Interpretation der Wirklichkeit, wenn ich mathematische Fraktale mit den biologisch vorhandenen Fraktalen vergleiche. Ihr Gerät/Kunstwerk meint vermutlich dasselbe - eine starke mechanische Vereinfachung. Irgendetwas rechnet. An jedem Punkt des Raumes, zu jeder Zeit. Zwar nicht immer dasselbe, aber immerhin. Raumpunkte, die zu einem Organismus gehören, gehören zum selben Fraktal (im Sinne Mandelbrot), folglich zur selben Gleichung (hochdimensional). Die Welt besteht aus einem Netz von feinstofflichen Energieströmen. Wo nichts strömt, kann auch nichts in der Existenz bleiben. Existenz (von was auch immer) ist nur im umgebenden geordneten Stromfluss möglich. Was wir Atom nennen, besteht aus vielen kleinen Wirbeln (UrAtome, 18 pro Nukleon), die wie auf Fäden aufgefädelt sind, und die zusammen ein blumenförmiges Netz bilden. Die Fäden sind feinere Energieströme, die den Antrieb der Wirbel bewirken. Reisst der Faden, zerfällt der Wirbel. Die eben betrachteten Fäden sind nur eine Größe von Netz. Nach innen und nach außen haben diese Wirbel noch Sub- und Über-Wirbel, die an Sub- und Über-Netzen hängen, diese wieder und wieder, Hierarchie für Hierarchie, alle verschieden dicht, alle ineinander verschachtelt. beschrieben werden. Ich sehe darin einen zweidimensionalen Goldenen Schnitt. Rechnet man diese Gleichung auf dem Computer, kommt ein humanoidähnlicher Schädel heraus. Oder/Und die 5 Links unten auf http://www.aladin24.de/ verfolgen. auf mehr als 95 Prozent ihrer Fragen auch Antworten. hatte er die Methode entwickelt, alle Züge pünktlich fahren zu lassen. wissen aber nicht, wie die Nazis eigentlich so produktiv sein konnten. Dafür war nicht nur Zuse verantwortlich, sondern auch Herman Hollerith. schaffte es nicht, das Dritte Reich aus der Antarktis zu vertreiben. sein, da die Computer bei ihren vielen Berechnungen sehr heiß wurden. nötig – Dieselgeneratoren, Personal und so weiter. Intel - out there, was wir nicht erfahren sollen. Konrad Zuse beschreibt 1970: „Das Universum funktioniert wie ein großer Computer, mit einem Code, der alles ermöglicht. Der junge US-amerikanische Informatiker Max Peterson bekommt auf einer Dienstreise in Bangkok ein Mobiltelefon zugeschickt, auf welchem Textnachrichten eingehen, die ihm Anweisungen für eine erfolgreiche Zukunft geben. Geldgewinnen jeweils tödlich verunglückt sind. der Ermittlungen führt die NSA jedoch in die eigenen Reihen und in ihr Echelon-System. Dieses System sollte ein Upgrade bekommen, welches jedoch vom Senat verhindert wurde, der nicht mit der Genehmigung einer totalen Überwachung sämtlicher Computer weltweit einverstanden war. welcher nun mit den beiden versucht, das Echelon-System zu stoppen. aufgebaut hat, auf welche es sich nun mit Hilfe von Max transferiert. dem sich das Echelon-System abschaltete. In Moskau trifft Yuri Malanin, der den Rang eines Hauptmanns im russischen Geheimdienst bekleidet, auf seinen Führungsoffizier. "Ja". Die Frage laute: "Sind die Spins der beiden Partikel parallel?" Information in den einzelnen Teilchen, braucht man so nicht zu bemühen. speichert also Information. Und sie verarbeitet die gespeicherten Daten. sprächen wir über die Natur als einen Quantencomputer. – Es ist 1983 im Montauk Projekt gelungen gesteuerte Zeitreisen durchzuführen. – Das Montauk Projekt sind Versuche die Zeit zu verändern / zu beeinflussen. – Zuerst haben Gedankenkontrollexperimente haben die Zeit gebeugt. – Mit diesem Zeitstrudel konnte man Menschen in die Vergangenheit und in die Zukunft senden. – Die Zeittunnel sollen so groß gewesen sein, dass sogar LKWs hindurch passten. – Es gibt sogar Hinweise für die tatsächliche Verwendung dieser Zeitreisen. – Durch diese Zeitreisen wurden ungewollt Paradoxien erschaffen und dadurch wiederum Parallelwelten erzeugt. – Das Montauk Projekt ist angeblich mit verschollenem Nazigold finanziert. – Wahrscheinlich sind die Technologien in der Area 51 weiter entwickelt worden. – Die NSA ist möglicherweise im Besitz von kleinen Kästchen, die den Träger komplett unsichtbar machen. – Dadurch wurde auch die Raum-Zeit-Linie verändert. – Seit 1983 geschieht nichts mehr so, wie es die großen Seher vorhergesagt haben. sondern um eine grundlegende Eigenschaft des Raums. sie in unserem Universum beobachten. eigentlich zweidimensional, sehen für uns aber dreidimensional aus. Theoretische Physik der TU Wien. den Formeln aus einem Astronomie-Lehrbuch einen CD-Player reparieren. betrachtet ist es positiv gekrümmt“, sagt Daniel Grumiller. IISER Pune, dem MIT, der Universität Kyoto und der TU Wien gearbeitet. Korrespondenz-Vermutung in einem flachen Universum bestätigt. holographische Prinzip auch in flachen Raumzeiten realisiert sein kann. Akademie der Wissenschaften in Daniel Grumillers Forschungsgruppe. funktioniert hat – ist wirklich bemerkenswert“, sagt Daniel Grumiller. Ilia Papa : wie nehmen die 2 augen die informationen aus "licht" auf, die dann das "gehirn" in dinge umREchnet ? > "chemische ver BiND ungen" sind nichts anderes als "spezielle"
Atome, die info-technichs bestimmte "eigenschaften" besitzen, also s.g.
die Sonnenlichtteilchen senden Impulse an unseren suprachiasmatischer Nucleus = unsere innere Uhren..? < = ja & NEiN ! > denk an den ENERGiE-POTENZiAL-AUSgleich ! ist immer "LiCHT" "TEiLCHEN" "WELLE" & "elektromagnetischer iM PULS"
"magnetisches" "in FORM ieren" der Atome, die den "Datenträger"
> oder WiE wandelt 1 BLATT / BAUM "licht" in "nahrung" um ? > oder wie "sonnenKOLLEKToren" "Strahlen" in ELEKTRiSCHEN stROM ? > was denkst du, WAS sie freiMAUERer & 666 ILLUMINATen vor "UNS"
"auch über die Sendemasten / Händy...und DAS System mußt du abstellen..
überleg mal selbst, wenn ALLES EiNS ist, an wen GENAU ?